An updated version of this report is available here. The updated version includes data on wages lost under the 2019 Trump administration overtime proposal that would have been received under the 2016 rule. The backstory: Millions of working people are working overtime but not getting paid for it because business interests have successfully challenged a 2016 rule that would have protected them. Federal law requires that people working more than 40 hours a week be paid 1.5 times their pay rate for the extra hours, but allows employers to exempt salaried workers who make above a certain threshold and are deemed to have executive, administrative, or professional duties. Basically, the threshold is supposed to help protect workers with little bargaining power—for example, modestly compensated front-line supervisors at fast-food restaurants—from being forced to work unpaid overtime. But the overtime pay threshold has been so eroded by inflation that people earning as little as $455 per week (the equivalent of $23,660 per year) can be forced to work 60 or more hours a week for no more pay than if they worked 40 hours. In 2016, the Obama Labor Department issued a rule that would have raised the overtime pay salary threshold to $47,476. But in November 2016—just before the rule was set to go into effect—a district court judge in Texas blocked the rule nationwide. Today, the Department of Labor published a proposal to set the salary threshold under which almost all workers are entitled to overtime pay to $679 per week, or $35,308 for a full-year worker, in 2020.1 The adoption of this proposal would leave behind an estimated 8.2 million workers who would have gotten new or strengthened overtime protections under regulations finalized in 2016.2 These 8.2 million workers who would be left behind by the Trump proposal include 4.2 million women, 3.0 million people of color, 4.7 million workers without a college degree, and 2.7 million parents of children under the age of 18. Further, due to the fact that the Trump proposal does not automatically index the threshold going forward, the number of workers left behind grows from 8.2 million in 2020 to an estimated 11.5 million over the first 10 years of implementation. The 2016 rule, which was held up in court3 following a challenge by business trade associations and Republican-led states, would have increased the threshold to $913 per week, or $47,476 for a full-year worker, from its current level of $455 per week, or $23,660 for a full-year worker. It would also have indexed the threshold to wage growth on a triennial basis; under the 2016 rule, the threshold would have increased to roughly $51,000 on January 1, 2020. The 2016 rule did require a large increase in the threshold, but only because the rule had not been appropriately updated since 1975. If the 1975 rule had simply been updated for inflation, it would be roughly $58,000 in 2020—well above the projected 2020 threshold of the 2016 rule, $51,000. The new proposed rule, at $35,308 in 2020, is around $23,000 less than the inflation-adjusted 1975 level. If the department finalizes its new proposal, millions of workers who should get overtime protections will fall through the cracks. In their proposal, the department provides estimates showing that 2.8 million fewer workers will be affected under their proposal than under the 2016 rule, but this is a vast underestimate, for two reasons. First, they use pooled 2015–2017 data, benchmarked to 2017 wage and employment levels, and state that these figures “are the Department’s best approximation for impacts starting in 2020.” This leads to an underestimate because it doesn’t account for employment growth and other changes in the three years between 2017 and 2020. I correct for this issue to the extent possible by using more updated data—pooled 2016–2018 data, benchmarked to 2018 wage and employment levels—and inflating employment and wage levels based on Congressional Budget Office economic projections for 2018–2020. Second, the department’s estimate of those left behind leaves out an entire group of workers who would be affected by the rule—those who will no longer get strengthened protections. To understand what a large omission this is, it is useful to keep in mind that there are two groups of workers who would be affected by any update to the overtime threshold. One group consists of those workers who get new protections under a new threshold—namely salaried workers who are bona fide managers, supervisors, or learned professionals who earn above the old threshold but below the new threshold. These workers are not legally entitled to overtime protections under the old threshold but would be overtime-eligible under the new threshold. But there is another large group of workers who are affected by any increase in the threshold—workers who get strengthened protections. Workers who get strengthened protections are salaried workers who earn above the old threshold and below the new threshold but who are not bona fide managers, supervisors, or learned professionals. These workers should have overtime protections under the old threshold—but because they earn a salary and earn above the threshold, they are vulnerable to being misclassified by their employer as overtime-exempt. However, once the threshold rises above their earnings level, their status as overtime-eligible becomes very clear. In their estimate of how many workers get left behind by their proposal, the department ignores the millions of workers who will not get strengthened protections under their proposal but who would have gotten strengthened protections under the 2016 threshold. 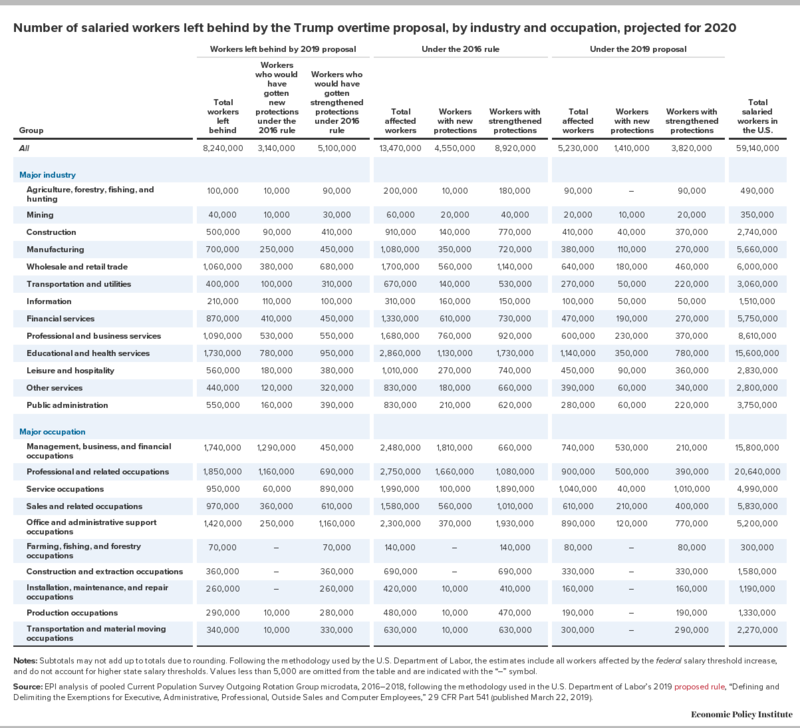 The tables below show how many workers will be left behind by the Trump proposal, both overall and broken down by whether these workers would have gotten new or strengthened protections under the 2016 rule. For reference, the tables also provide the underlying numbers of workers who would have gotten new or strengthened protections under the 2016 rule and the numbers who would get new or strengthened protections under the 2019 proposal. 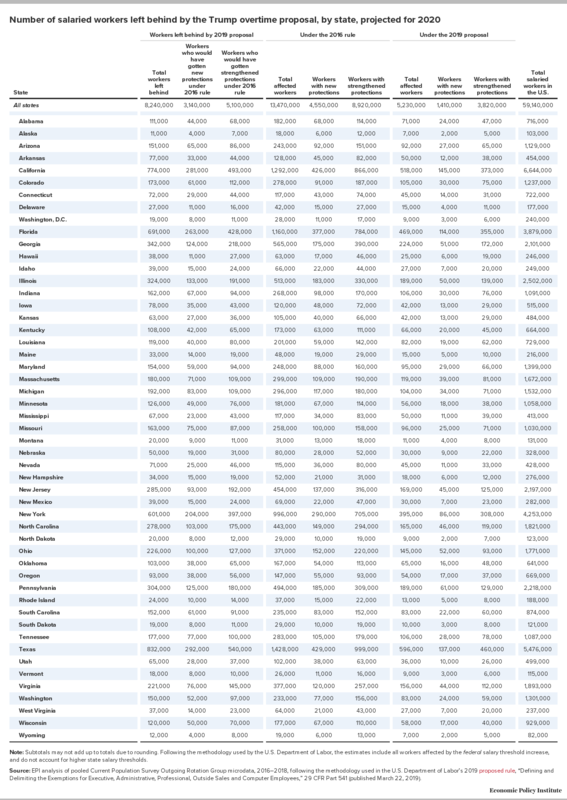 Tables 1–3 provide breakdowns by demographics, major industry and occupation, and state. 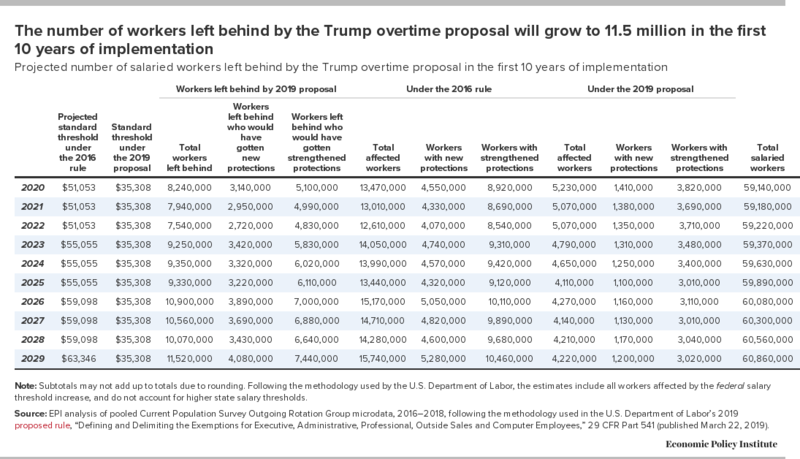 Table 4 shows the increase in the number of workers left behind during the first 10 years of implementation due to the lack of automatic updating in the Trump proposal. In its economic impact projections, the department does not assume the threshold will be updated in future years. It is worth noting, however, that the department claims that it is “committing to evaluate” the threshold “more frequently” going forward, in particular mentioning a flexible commitment to notice and comment rule-making to increase the threshold every four years. Given that notice and comment rule-making is extremely time- and resource-intensive—the 2016 rule-making took more than two years—this is an enormously inefficient way for the government to operate (and is why huge stretches of time go by between rule-makings). It makes little sense to go through notice and comment rule-making just to maintain a standard—that process should be reserved for when policymakers want to change the substance of a rule, while automatic updating should be used to ensure that the standard does not erode in the meantime. Further, automatic updating provides crucial predictability for employers. With automatic updating, as opposed to a vague claim that updating will be considered every four years, employers know exactly what to expect and when to expect it. Given the large number of workers who will be left behind under this proposal who would have been covered by the painstakingly justified 2016 rule, we encourage the department to drop this rule-making and instead defend the 2016 rule. Further, defending and then implementing the 2016 threshold would lead to better use of one of the most precious resources of working families in this country—their time—by providing an incentive for employers to balance the additional hours they ask of their workers with the costs of either overtime pay or of raising salaries to the new salary threshold. That incentive is consistent with a fundamental principle embodied in the Fair Labor Standards Act—that workers should receive a fair day’s pay for a long day’s work. The department’s new proposed rule—which is based on the notion that someone struggling by on $35,000 a year is a highly paid executive who doesn’t need or deserve overtime protections—flies in the face of those principles and should be abandoned. Total salaried workers in the U.S. Note: Subtotals may not add up to totals due to rounding. Following the methodology used by the U.S. Department of Labor, the estimates include all workers affected by the federal salary threshold increase, and do not account for higher state salary thresholds. Source: EPI analysis of pooled Current Population Survey Outgoing Rotation Group microdata, 2016–2018, following the methodology used in the U.S. Department of Labor’s 2019 proposed rule, “Defining and Delimiting the Exemptions for Executive, Administrative, Professional, Outside Sales and Computer Employees,” 29 CFR Part 541 (published March 22, 2019). Notes: Subtotals may not add up to totals due to rounding. Following the methodology used by the U.S. Department of Labor, the estimates include all workers affected by the federal salary threshold increase, and do not account for higher state salary thresholds. Values less than 5,000 are omitted from the table and are indicated with the “–” symbol. 1. Defining and Delimiting the Exemptions for Executive, Administrative, Professional, Outside Sales and Computer Employees [proposed rule], 84 Fed. Reg. 10900–10969 (March 22, 2019). 2. Defining and Delimiting the Exemptions for Executive, Administrative, Professional, Outside Sales and Computer Employees [final rule] 81 Fed. Reg. 32391–32552 (May 23, 2016). 3. See Celine McNicholas, Overtime Ruling Rests on Flawed Logic and Undermines the Rights of Working People to Get Paid for Their Time on the Job, Economic Policy Institute statement, August 31, 2017. 4. See Celine McNicholas, Samantha Sanders, and Heidi Shierholz, What’s at Stake in the States if the 2016 Federal Raise to the Overtime Pay Threshold Is Not Preserved—and What States Can Do about It: State Action to Modernize Overtime Rules (Research Report), Economic Policy Institute, November 2017. 5. EPI analysis of pooled Current Population Survey Outgoing Rotation Group microdata, 2016–2018, following the methodology used in the U.S. Department of Labor’s 2019 proposed rule, Defining and Delimiting the Exemptions for Executive, Administrative, Professional, Outside Sales and Computer Employees [proposed rule], 84 Fed. Reg. 10900–10969 (March 22, 2019).